artisan confectioner Gateau Et Ganache. Photo by Dhanraj Emanuel | THE NIBBLE. It’s National Toasted Marshmallow Day, but today’s supermarket marshmallows are nothing to celebrate. Over the decades, what was once a melt-in-your-mouth confection has acquired the personality of a cotton ball—but not as soft. In the early 1950s, Kraft Foods developed a technique to make vast quantities of marshmallows commercially. The process drastically changed the delicate texture of handmade marshmallows, and the use of artificial flavors made the airy delight much less delightful. While mass-produced marshmallows are fun to pop into hot chocolate or toast for s’mores, how many of us enjoy eating them straight from the bag? 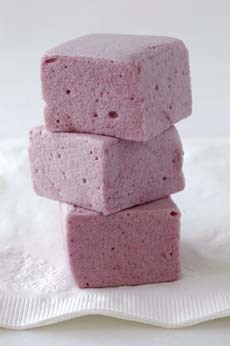 So today’s tip is: Seek out handmade gourmet marshmallows from a marshmallow specialist. Think of gourmet marshmallows as you would fine chocolate. They’re an all-occasion gift with the bonus of being fat-free and gluten-free. If there’s no artisan confectioner near you (or in your specialty foods store), check out our recommendations for the best gourmet marshmallows. Brush up on the history of marshmallows. Marshmallows get their name from the marsh mallow plant (Althea officinalis), the root of which contains a sticky, white, almost jelly-like substance. The Egyptians combined it with honey as early as 2000 B.C.E., to make a candy.